Breast cancer is the most common tumor in women. In the world, the incidence of carcinoma of this type can be estimated at 4 to 5 per hundred women. In addition, of every hundred breast cancers, 99 based on the female population, while one occurs in male. For this type of tumor it has several therapeutic weapons such as surgery, radiotherapy, chemotherapy and hormone treatment. Some have a field of local or regional action, as with surgery and radiation therapy aimed at eradicating the disease through direct action on the breast and sometimes on the nearby lymph nodes. However, hormone therapy and chemotherapy extend their action throughout the body and are generally complement the first. The type and extent of breast surgery depend on the size of the cancer. You can always conservative breast surgery is used with or without removal of lymph nodes. However, on other occasions the removal of all breast tissue with axillary lymph and sometimes even the breastplate minor muscle is needed. Removal of these nodes may hinder normal lymphatic drainage arm, favoring the subsequent appearance of edema (swelling), largely. General recommendations for Care after surgery of the breast and armpit. There are instructions and measures relating to the care of the arm after the removal of these nodes that are essential to, first, regain mobility shoulder can sometimes be affected, and in turn prevent possible further complications as limiting the range of motion, arm infections, edema, etc. These recommendations and exercises should be performed early and progressive manner, on the arm and armpit corresponding to the operated shoulder. 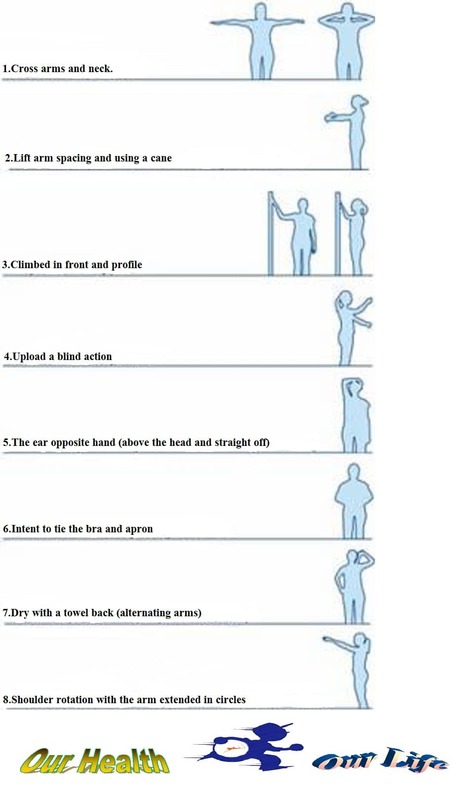 General recommendations: image of the exercises described below. Lift arm spacing and using a cane. Climbed in front and profile. The ear opposite hand (above the head and straight off). Intent to tie the bra and apron. Dry with a towel back (alternating arms). Shoulder rotation with the arm extended in circles. They must be made progressively after surgery, to regain normal mobility of the shoulder. You must ensure, while sitting, keeping his arm resting on top. 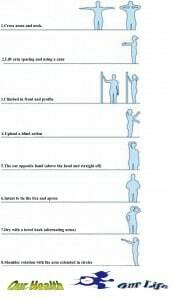 Avoid carrying the hanging arm, especially with some weight. Avoid sleeping on your arm operated. Avoid overloading or effort with that arm. Meticulous care of the skin (soap, moisturizers …). Try shave cream or electrically. You must be careful when cutting nails and making manicure. Avoid application of irritants (colognes, deodorants with alcohol, etc.). Do not use objects that compress (rings, watch, firm sleeves …). Use a bra with wide straps, avoiding pressure on the shoulder. Avoid blood draws in that arm. Avoid heat on your arm: sun, oven, iron, hot water, etc. On the beach or field, use high sunscreen: avoid high temperatures. Beware of prickly plants and insect bites. Avoid sports that require sudden arm movements (tennis, golf, judo …). It is advisable to practice swimming. If any wounds or insect bite occurs, it must urgently apply antiseptic on it and extreme above measures. If, despite these precautions they appear inflammatory signs (redness, warmth, swelling somewhere in the arm), talk or see your doctor. It is free and should be varied, avoiding overweight and excess salt. There prosthesis made of materials that are resistant, increasingly resemble normal breast. The most commonly used are silicone, which offer a good tolerance: they are in shape and variable weights and resist the solar heat and water, allowing the bathrooms. The prosthesis after mastectomy, will initially cotton, subsequently passing to a heavier silicone. In specialized stores, clothes are adapted to external breast prostheses.